Not to like ice cream is to show oneself uninterested in foods. Honestly, there are no words. 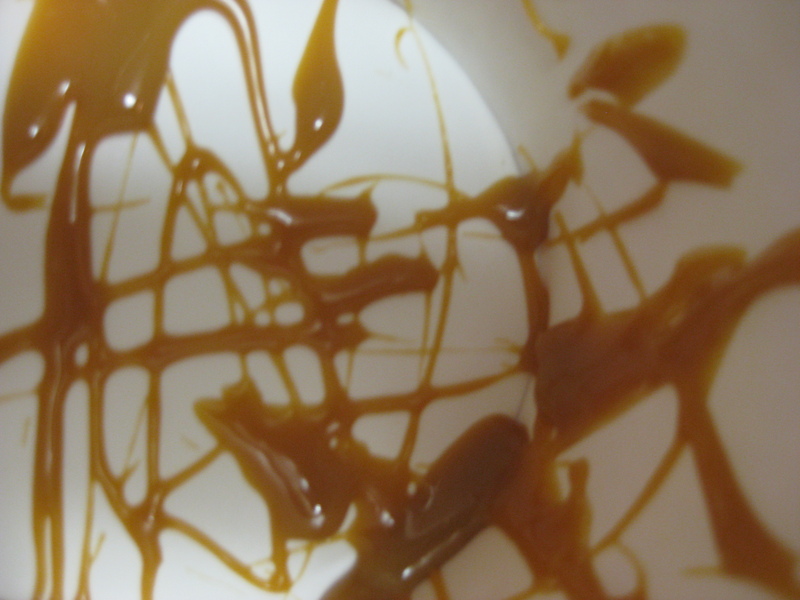 In a recent post about my love affair with dulce de leche I described a rather embarrassing moment in my lifetime, and an all-time low in the world of gluttony. For some odd reason, I find myself there again. To set the record straight for any of you who may be confused, I love chocolate and caramel. Really – it’s the perfect marriage between creamy, chewy, milky and just thinking about it I am salivating. Writing this post is really hard because I just want to be eating chocolate caramel right now. Ugh. Back to the point. When The Husband and I were recently in Argentina we made it a point to eat at all the famous ice cream places. There were Freddo and Persico (two of the big chains) and a much lesser known but wildly superior Chungo. We discovered this little known gem on our second to last night in Buenos Aires (how we waited that long to try that place is something I will never understand) and it was on that very momentous night that I had the most perfect dulce de leche gelato EVER. So much so that we went back the next day to purchase a 1/2 kilo “to go” so that we could eat it in the taxi on the way to the airport (a poorly thought out idea, considering I would be sitting on an airplane for 11 hours with nothing but gobs of gelato in my belly!). 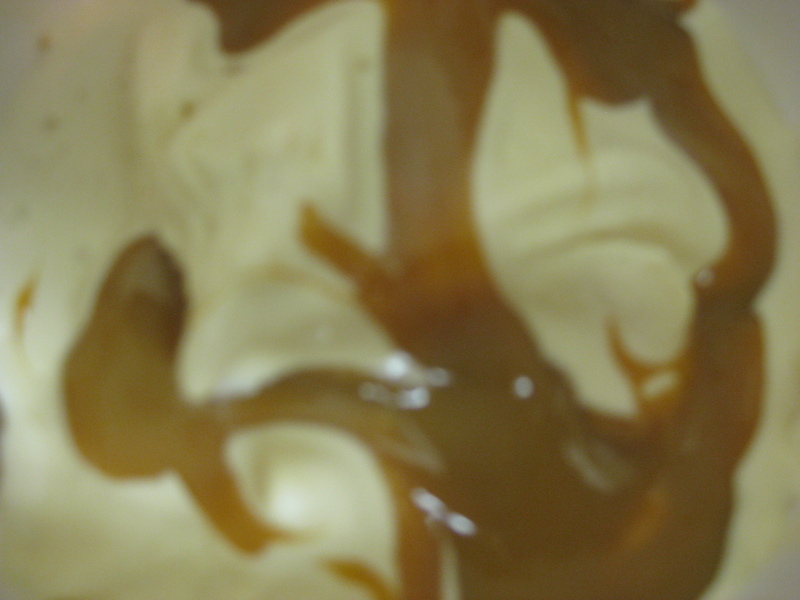 When I started this blog I decided that dulce de leche ice cream or gelato would have to be one of my first few posts. The rationale: I am going through withdrawal. 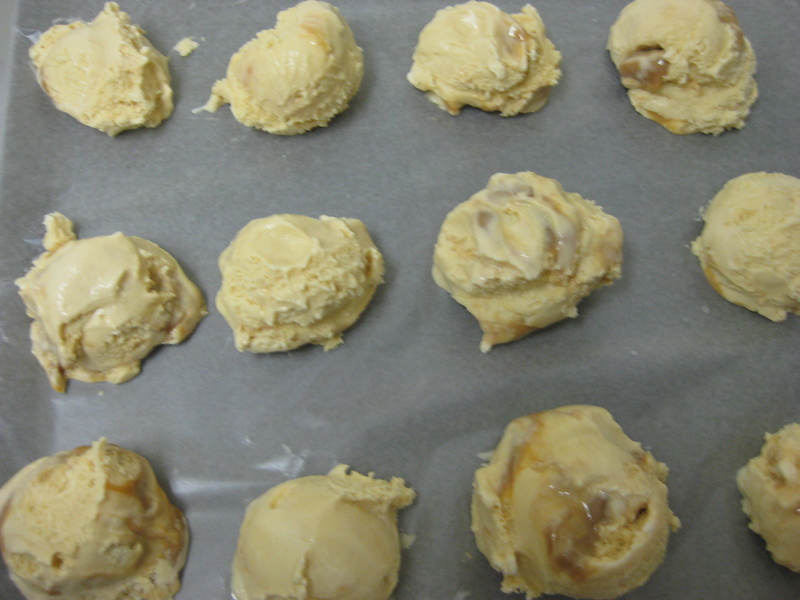 I also promised myself not repeat recipes throughout the course of this blog because there are so many incredible ice cream combinations to be had, but I will most certainly be making a variety of dulce de leche products. The rationale: I cannot live without it. I realize that in re-reading this blog post I sound a little nutty, but it’s the truth. I love dulce de leche. So, as you saw in my post last week, I made the dulce de leche, the base for this recipe. You will see how it is incorporated below. In a heavy saucepan, combine the milk and the cream. Place over medium-low heat and cook, stirring or whisking occasionally so a skin doesn’t form, until tiny bubbles start to form around the edges. If you are using a thermometer the mixture should reach a temperature of 170 degrees F.
Meanwhile, in a medium heat-proof bowl, whisk the egg yolks until smooth. Gradually whisk in the sugar until it is well incorporated and the mixture is thick and pale yellow. A word to the wise about this – you really need to whisk a lot, not only so that the sugar dissolves, but also because you really want to whip the yolks to make them slightly frothy and creamy. Temper the egg yolks by very slowly pouring the hot milk mixture while whisking continuously. You need to pour the milk mixture little by little so that it does not heat the egg yolks too quickly and create scrambled eggs. NO ONE wants scrambled eggs gelato! Return the custard to the saucepan and place over low heat. Cook, stirring frequently with a wooden spoon, until the custard is thick enough to coat the back of the wooden spoon or spatula (and you can run your finger across the spoon and it leaves a clean path where your finger was). If using a thermometer the custard should reach a temperature of 185 degrees F. Whatever you do, do not bring this to a boil. Pour the mixture through a fine mesh strainer into a clean bowl and let cool to room temperature, stirring every 5 minutes or so. It’s important to strain the mixture because inevitably a few clumps of egg will be at the bottom, and you don’t want clumpy, egg gelato! To cool the custard quickly, make an ice bath by filling a large bowl with ice and water and placing the bowl with the custard in it; stir the custard until cooled. Once it’s completely cooled, cover and refrigerate until very cold, at least four hours or overnight (I recommend overnight!). Here comes the dulce part! Once the mixture is totally cooled, place half of the mixture in a blender and add 1/2 cup of the dulce de leche. Blend until smooth, then whisk into the remaining base. Pour the mixture into the container of an ice cream machine and churn according to the manufacturer’s instructions (for me it was approximately 25 minutes). In a small saucepan over low heat, gently warm the remaining 1/2 cup dulce de leche. Just after churning the custard, transfer a few scoops of the gelato into the container you’re freezing it in, and drizzle a few tablespoons of the dulce de leche over it. 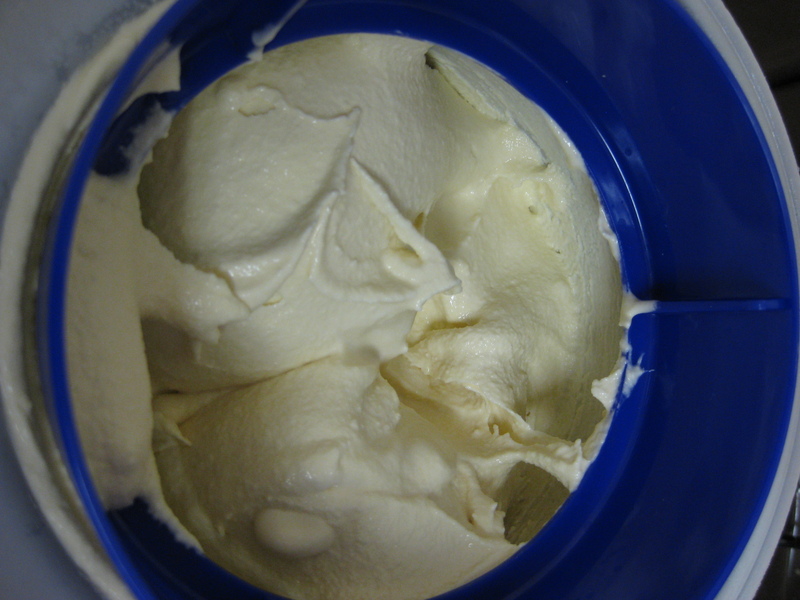 When I made this amazing treat, the gelato was so extremely soft and creamy that it needed to freeze over night. I should note here that what made this treat truly extra special was the drizzle of chocolate ganache on top. Like I said, something about caramel and chocolate really is to die for, and I could not resist adding that ganache to this ice cream. It was heavenly together. I strongly recommend that you do the same!